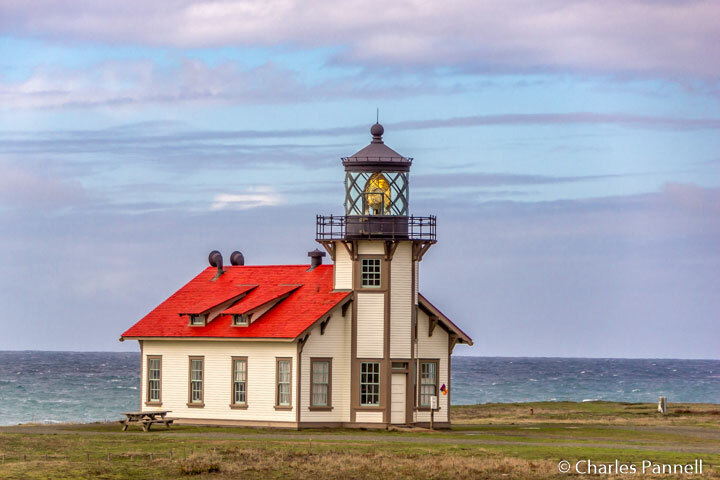 Located on the scenic Mendocino coast, halfway between Russian Gulch State Park and Caspar Beach, the Point Cabrillo Light Station (www.pointcabrillo.org) has long been a beacon to sailors. Ironically the clipper ship Frolic collided with the rocky California shoreline in 1850, just north of the future location of the light station. Nearly 60 years later on June 10, 1909, the Fresnel lens was first illuminated at Point Cabrillo, and today this active light station not only offers an interesting glimpse into maritime history, but also affords adventuresome visitors the opportunity to spend the night. 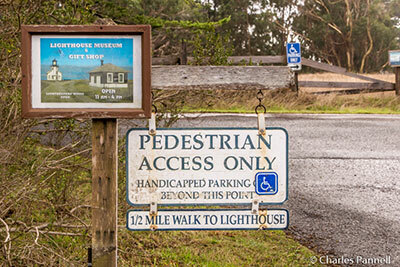 Accessible parking is available in the main lot near the Kearn Farmhouse, which is about a half-mile walk from the light station. The pedestrian path to the light station is wide and paved, however it’s downhill on the way there, and the hike back is a bit steep. That said if you can’t manage the walk and you have an accessible parking placard you can drive down the road and park in front of the 2nd Assistant Lightkeeper’s residence, which is just a short level walk from the light station. The restored blacksmith and carpentry shop, which is located across from the accessible parking area, is worth a stop on the way to the light station. There is a two-inch cement lip at the entrance, but if you can manage that obstacle, there’s enough room for a wheelchair inside the small building. The highlight of the exhibit is a 240-gallon saltwater aquarium filled with urchins, sea stars, anemones, squid and a variety of other California marine life. Other interpretive exhibits, photos and artifacts are spaced throughout the two-room structure, and together they offer a good primer on the flora and fauna of the area. The light station itself is located next door. Although there’s a ramped entry in front, there is a gravel patch near the door that may be problematic for some wheelchair-users. Alternatively the double-wide back door, which is adjacent to a sidewalk, can be opened on request for easier access. Inside, there’s plenty of room to navigate a wheelchair around the interpretive exhibits and through the small gift shop. Artifacts include old photos, instruments, ship models and even the canon which was salvaged from the Frolic. Save some time for a peek inside the 1st Assistant Lightkeeper’s residence, which is located near the accessible parking area. There’s ramp access to the building, and barrier-free access around the first floor. Built in 1909, the residence is furnished as it would have been in 1935, after electricity was added to the building. There are also accessible restrooms in the small building behind the residence. Point Cabrillo is a lovely spot for a picnic lunch, and there are several accessible picnic tables on a grassy spot near the accessible parking area. So pack along some provisions, and enjoy the spectacular view. Although a day visit to the light station is great, nothing beats spending the night there, as after the day crowds retreat, it’s peaceful and quiet. There are four restored buildings available for rent, two of which are accessible. West Cottage (www.mendocinovacations.com/view_house-43.html), which is closest to the light station, is my top pick for wheelchair-users and slow walkers. There’s no on-site lodging manager at the light station, and to be honest that’s part of the beauty of it all. 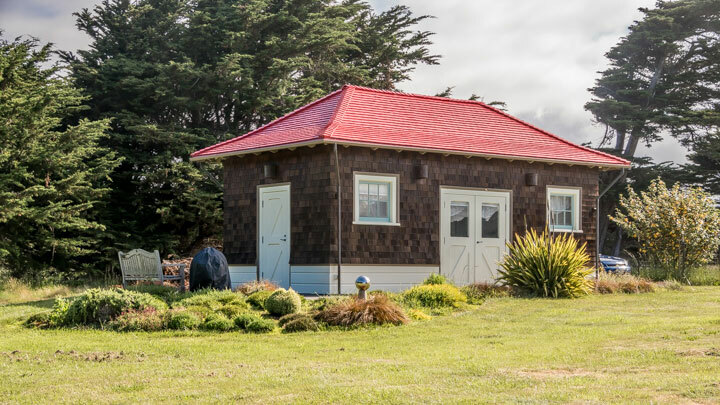 Instead, guests pick up their keys at the Mendocino Coast Reservations Office, just a few miles away in downtown Mendocino. There’s ramp access to the office, with level parking in front, and an accessible parking space across the street. It’s about a five-minute drive out to the light station from town. Unlike day visitors, overnight guests are permitted to drive their vehicles all the way down the path to the light station. West Cottage is located behind the 2nd Assistant Lightkeeper’s residence, and although there’s no striped parking, there’s plenty of space to park an accessible van near the cottage. There’s level access over to the wide front door, and plenty of room to navigate a wheelchair through the spacious suite. 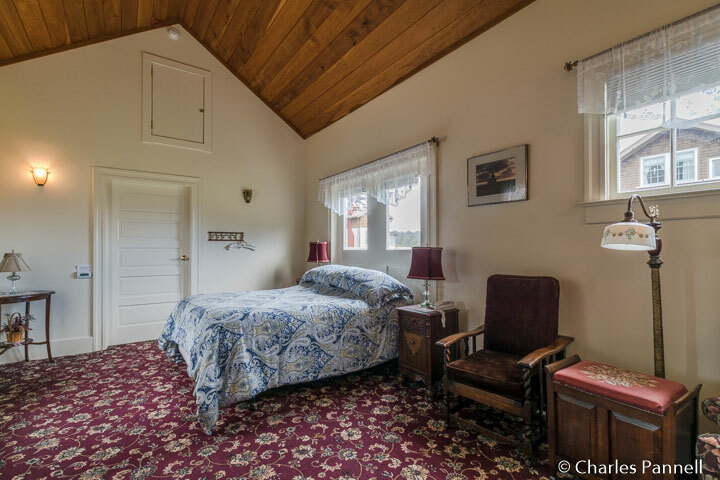 The cottage is nicely decorated and filled with period furnishings including two chairs and a small table, a vanity, and a 28-inch high queen-sized bed with wheelchair access on both sides. It’s also outfitted with a few modern conveniences such as a small refrigerator, a microwave, a coffee maker, a DVD player and four TV trays. 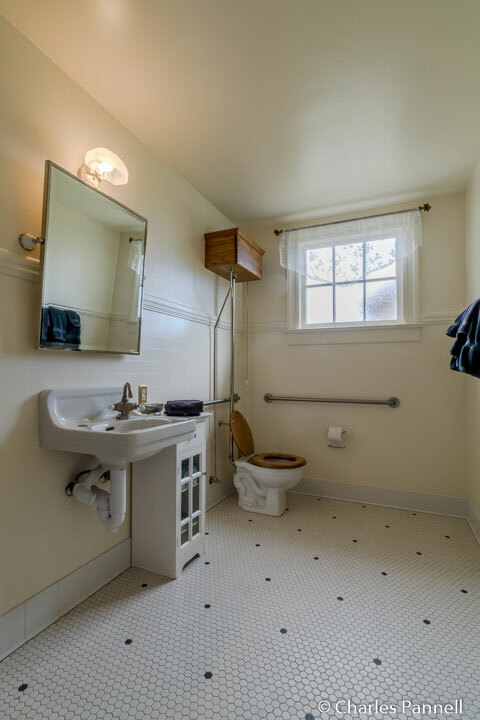 The bathroom has a full five-foot turning radius and is equipped with a roll-in shower with grab bars, a hand-held showerhead and a fold-down shower seat. There’s a nice angled mirror above the roll-under sink, and the toilet grab bars are located on the left and back walls (as seated). 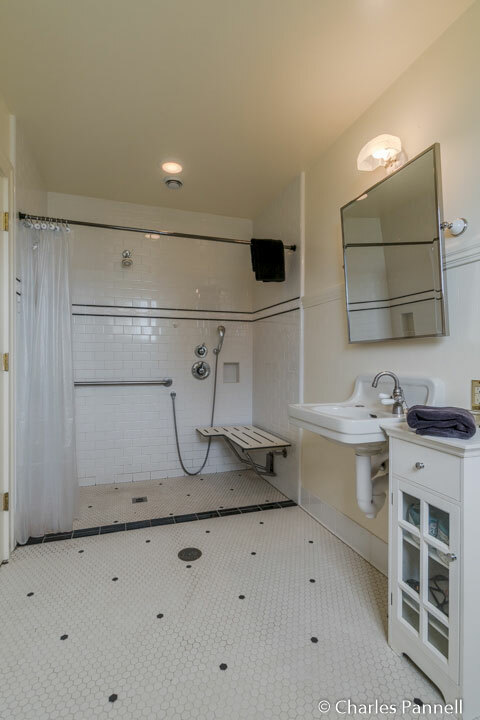 And in keeping with the 1930s decorating theme, the floor is covered in black and white chicken wire tile, and the toilet is a vintage water closet pull-chain model. Outside there’s a small cement patio with a bench and a new Weber charcoal grill. It’s the perfect place to enjoy the sunset and cook up a tasty dinner. The cottage isn’t fancy, but it’s certainly very comfortable, and includes a lot of often overlooked access features such as low-pile carpet. Plus, you just can’t beat the secluded location. As an added bonus, there’s no cell phone reception or cable TV, but you can always borrow a DVD from the rental office. There’s a land line for emergencies, and a prepaid long distance card is also included with the rental. So in the end it’s really your choice as to how connected with the outside world you will or won’t be during your stay. West Cottage can be rented alone or along with any of the other three buildings on the premises. There is ramped access to the three-bedroom 2nd Assistant Lightkeeper’s residence, which makes it a good choice for public gatherings if multiple units are rented. For larger groups, the four-bedroom Head Lightkeeper’s residence is a nice pick, although it’s only accessible by stairs. And if you need another accessible unit, East Cottage has the same features as West Cottage, but it’s a little farther from the ocean. No matter what your choice though, you definitely won’t be disappointed with the ambiance.